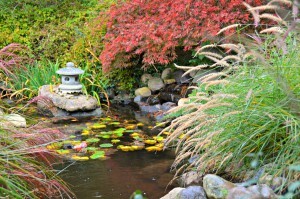 Grasses and a Japanese Maple give color and texture to a fall landscape. Fall is a great time to plant – it gives your plants a jump start on getting some roots established. And there is the added bonus that trees, shrubs and perennials are on sale in the Fall! Watering in any newly planted trees, shurbs or perennials. Planting grass. It is the perfect season to get that patch of grass established or revitalizing an old lawn. Sod is readily available and easy to water in or you can choose to seed. It is cheaper to seed, but you will need to put down some topsoil and water in. Continue to water lightly and regularly so that the top few inches of soil don’t dry out (it’s easier to accomplish now that we have cooler temps out!). And just a heads up, it’s advisable to over seed again in the spring. Cut back/dead head perennials. Leave all basal leaves (the leaves at the bottom of the stalk), but cut back dead flowers and stalks. Some perennials, such as Echinacea (purple cone flower) you can leave as a food source for birds. Pack away the veggie garden. Take out any dead summer annual veggie plants – I’m looking at you pepper and basil plants! Once your tomatoes are done producing take down with their cages or support system. Usually, I like to put down/rake a fresh batch on fallen trees leaves over my veggie bed. Just a few inches deep. And then in the spring I’ll turn the leaves over into the soil. Kinda an on the spot leaf composting. Put Roses to bed. It’s important to build up mulch around the crown of your roses to protect them over the winter. It’s just as important to gently remove said mulch around the crown come spring. Protect hydrangeas. If you have some extra leaves lying around that you just can’t bear getting all the way to the curb again, put them on and around the base of your hydrangeas. It will help protect them in the winter. Annuals It’s time to revisit your annual patch and/or containers. Consider replacing some of the more tired looking summer annuals with some fresh cool weather color. Pansies, celosia, and decorative cabbage are a good place to start for a new pop of color! This entry was posted in Gardening, Landscape, Lawn, perennials and tagged autumn, clean up, Fall, grass, landscape. Bookmark the permalink.